Change notification, general (launch at startup, share location), chat, password, voicemail PIN, and language settings in the Windows desktop app in Preferences. See Download the desktop app to get the free application. Note: Some PureCloud users refer to the Windows desktop app as the Windows desktop client. 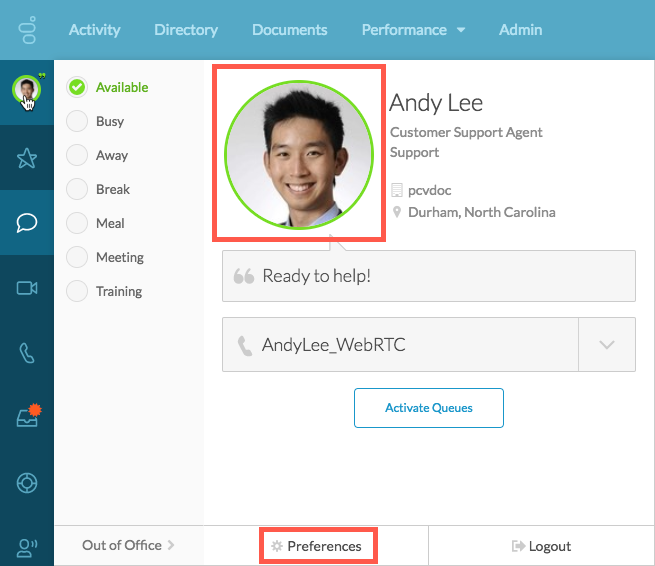 From the sidebar, click your profile picture to access user settings, then click Preferences. You can also access Preferences from the desktop app menu in the menu bar. 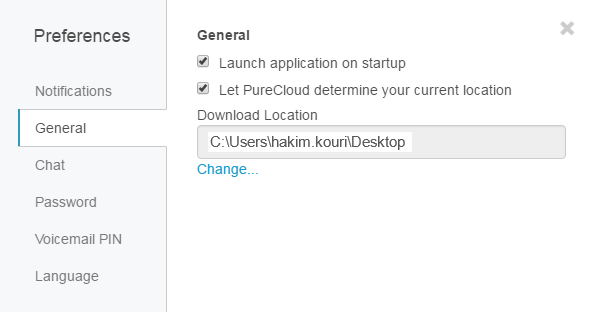 Click the PureCloud icon, then click Preferences. 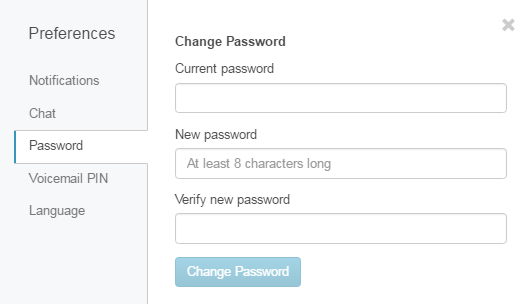 Change a setting in one of the Preference tabs. PureCloud alerts you to events such as new direct and group chat messages and incoming calls. You can control these notifications. From Preferences, click Notifications. Change your settings to suit your needs. Choose whether you receive notifications on your desktop. To stop receiving PureCloud notifications, clear the Allow Pop-up Notifications check box. Choose whether you receive notifications about new group chat messages. Direct messages and mentions in group chat rooms always create a notification, even if you hide all group chat notifications. 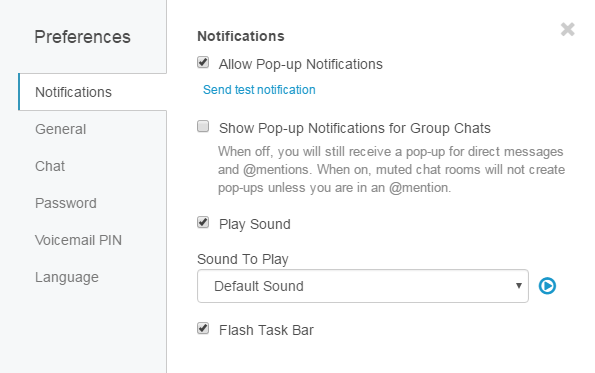 Note: To see the Show Pop-up Notifications for Group Chats option, first select the Allow Pop-up Notifications check box. If you do not Allow Pop-up Notifications, then you do not receive group chat notifications. Play Sound Choose whether notifications produce a sound. If you do not have desktop notifications enabled, sounds do not play for message even if you select the Play Sounds check box. Flash Task Bar Choose whether you want the PureCloud app icon to flash in the taskbar when you receive a new message. 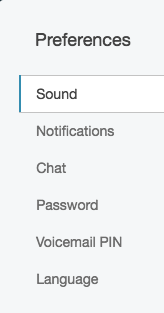 If you enable this setting, it flashes even if you have not selected the Enable Desktop Notifications check box. Change the default settings for launch at startup and share your current location. From Preferences, click General. Change the settings to suit your needs. Select to launch the Windows desktop app at startup. Select to share your current location with other users. Select a download location Click Change… to specify a location for saving downloads or keep the default location. From Preferences, click Chat. You can also access chat preferences from the chat panel. 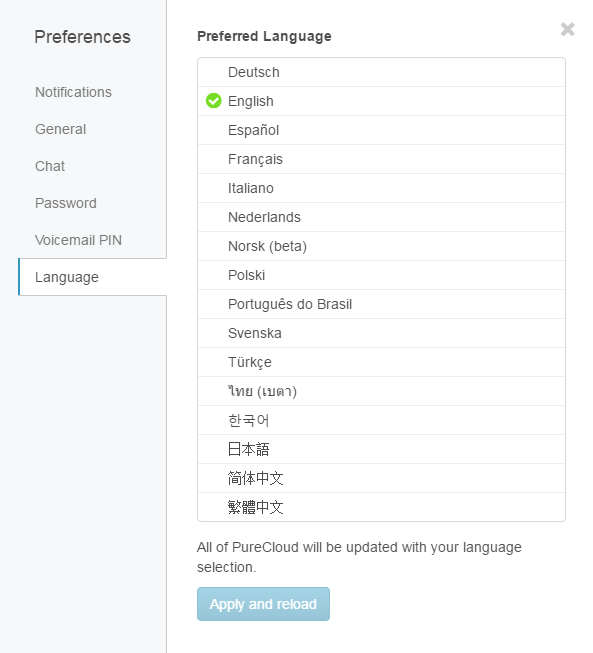 Choose how PureCloud lists chat rooms in the chat roster. To display the first row of gifs to choose from, select Collapsed by default. 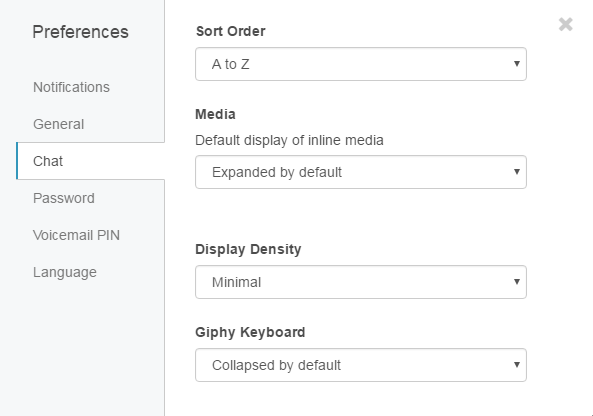 To display the first four rows of gifs to choose from, select Expanded by default. To keep the display in the state last used, select Remember last state. 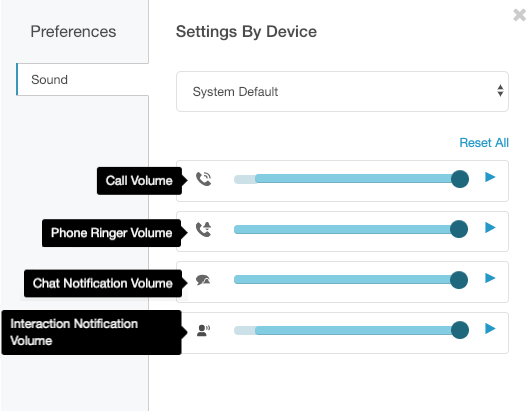 Use your voicemail PIN to access your voicemail from your phone when you are not logged on PureCloud.